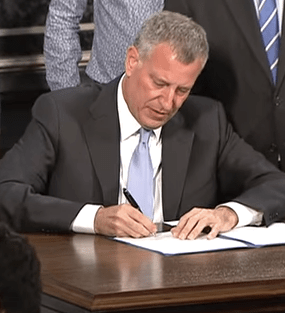 Mayor Bill de Blasio signed a bill yesterday requiring side guards on all large city trucks, and on private garbage trucks operating in New York City, by 2024. When a truck driver strikes someone with the side of the vehicle, the guards prevent people from getting crushed beneath the truck’s rear wheels. They have been proven to reduce deaths and serious injuries where they are used. The side guards bill covers approximately 10,000 trucks that weigh more than 10,000 pounds, according to Council Member Corey Johnson, who sponsored the legislation. That breaks down to 4,500 vehicles in the city fleet, including approximately 2,700 Department of Sanitation vehicles, and 5,500 to 6,000 private trash haulers regulated by the Business Integrity Commission. The eight-year timeline for the new law is intended to let DSNY phase in side guards by requiring them on all new vehicles, a less expensive option than retrofitting existing trucks. Private sanitation haulers, which have older fleets, will likely have to retrofit many of their vehicles to meet the 2024 deadline. The bill passed with the support of the National Waste and Recycling Association, an industry group. City Council Transportation Committee Chair Ydanis Rodriguez revived a push for side guards after cyclist Hoyt Jacobs was killed in Long Island City by a private trash truck driver making a right turn. “Should a side guard have been installed, Hoyt might be with us today,” Rodriguez said at the bill signing. Trucks make up just 3.6 percent of vehicles on New York City streets, according to U.S. DOT, but are involved in 12.3 percent of pedestrian fatalities and 32 percent of bicyclist deaths. Side guards have a proven track record: After the United Kingdom required them in 1986, the fatality rate for pedestrians hit by the side of a truck dropped by 20 percent. The fatality rate for cyclists in similar crashes fell by 61 percent. New York becomes the second large American city to require side guards on its city fleet, following Boston, which mandated them last year. Side guards are standard equipment on trucks in Europe, Brazil, Japan, and other nations. The U.S. federal government has yet to take action on the issue. De Blasio also signed a bill from Council Member Margaret Chin requiring DOT to study bicycle and pedestrian safety on truck routes, including the impact of tolling policies on truck traffic, and a bill from Council Member Paul Vallone requiring a DOT study on truck route compliance. Vison, “It’s not like people are dying. Oh they are? Whatever,” Zero Rush. with a Clinton rear underride guard. other with sufficient strength is meant to protect all road users. Administration will be known as the de Blasio guillotine side guards. motivation to kill fewer Americans for corporate donations and hopefully end these corporate partnerships that kill so many of our loved ones. Divide and conquer, corporate power and divisive politics when safety advocates start winning the conversation. Millions in public money to crush any opposition! Bikers and car drivers unite, many of us are both! More information at http://www.underridenetwork.org .